We started with the LBJ museum and library in Austin. There were lots of interesting things to see. I enjoyed a presentation of LBJ’s humor the best. 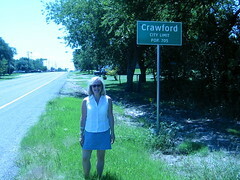 Next, it was off to Crawford. I was a little apprehensive about going with the Cindy Sheehan ordeal. We arrived about noon and were shocked by the lack of people. The streets were basically empty like most Texas small towns. There were a couple of tourist stores that were suprisingly tasteful, and Esther enjoyed several conversatons with the proprioriters and visitors. (One family was from Germany for the second year in a row) We drove out towards the Bush ranch expecting hordes of traffic and people; instead, we found ‘Camp Casey’ with less than a hundred people and half a dozen news trucks. Esther was anxious to get out even though I told her she might be mistaken for a protester. We sheepishly walked around a little and took pictures of the crosses. We didn’t see Cindy Sheehan, but walked by her booth. We also drove out closer to the ranch until we came to a blockade. There was nothing unusual looking about the ranch. You would never guess that the leader of the free world lived down that dirt road. After Crawford, it was off to Dallas. We arrived in time to go to the Sixth Floor Museum in the Texas School Book Depository Building. The museum of JFK’s assassination is pretty impressive. Standing by the window looking down on Elm Street is quite sobering. We also walked through Dealey Plaza. We found a reasonable motel for tonight. The one big disappointment of the day was that all the pictures we took are lousy because I forgot to switch the camera back to auto after having it on manual. But it was a great day of seeing interesting things that we have heard about for many years.